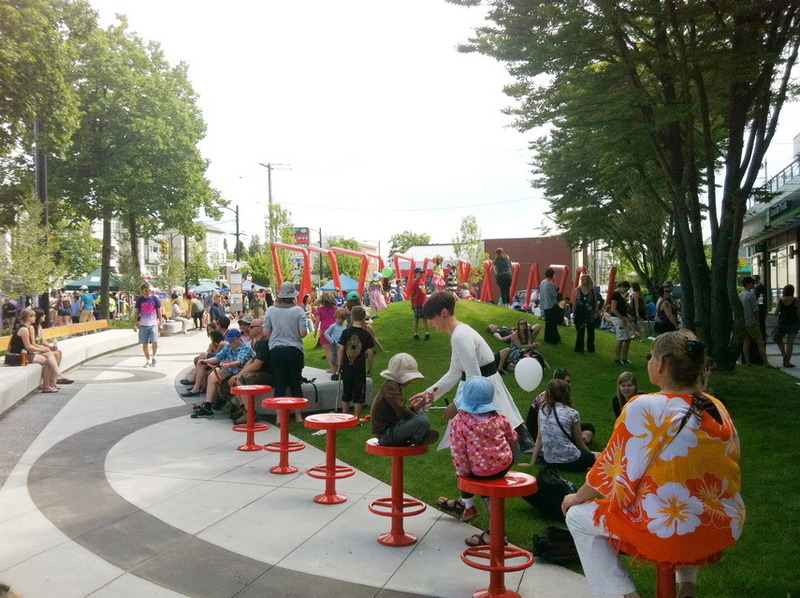 I love tiny parks—the more itty-bitty the better—and when I was back in Vancouver recently, I made sure I went to visit the relatively new Mid Main Park at Main and 18th Street done by Hapa Collaborative. I had been watching the design process from my perch in Toronto and was excited to see what it looked like in person. In short, the park is awesome, and it can teach us a lot about how to create great small parks. There are a few reasons why this park is great. One is that it uses its space incredibly well, creating different rooms in a pretty tiny park by changing the elevations, using curved pathways, and incorporating distinct design elements in different places. It’s also located at an interesting bend in Main Street and creates a nice place to stop and people watch. The other reason though is found in the whimsy of its design. As this recent post in the excellent blog The Dirt points out, the design of the park was meant to evoke the feel of a nearby ice cream shop that had closed in the 1980s. The park includes candy-red stools, a sculpture that resembles bendy straws, long concrete benches, and a small grassy knoll. Too many times, small parks are left as a patch of grass with a bench or two when they can be so much more. Dare to dream big, tiny parks! The final reason is that the park is also an excellent example of what can happen when a city reclaims under-utilized roadway for park space. The design called for the closing of a slip lane on the western portion. Closing this lane and turning it into part of the park allowed this piece of public space to be stitched back into the city.